If you are currently using Pretty Good MahJongg Mac Edition, whether purchased from the Mac App Store or downloaded directly from Goodsol Development, we recommend waiting for the next update before upgrading to macOS Sierra (10.12). Apple is scheduled to release macOS Sierra, the next version (10.12) of their operating system (formerly: Mac OS X) today [September 20, 2016]. As of the final beta version, there is a change (as yet unidentified) that breaks Pretty Good MahJongg Mac Edition. We are actively working on a solution, and we will publish an update as soon as a fix is available, but in the meantime, we suggest keeping El Capitan (Mac OS X 10.11). Get the best MahJongg Solitaire program shipped to your door. For a limited time only: Be the first to review this item. MahJongg Solitaire and Tile Matching for Windows and Mac OS X.
Goodsol Development has published Pretty Good MahJongg 2.41 and Pretty Good MahJongg Mac Edition 2.02, maintenance updates to this award-winning MahJongg game, featuring both original solitaire games and traditional tile matching puzzles, available for both Windows and Mac OS X. Pretty Good MahJongg contains 300 tile matching layouts, an integrated layout editor, and 55 solitaire and puzzle games, most of which are original and unique, including Pyramid of Wild Dragons, which was designed exclusively for this product by Thomas Warfield. 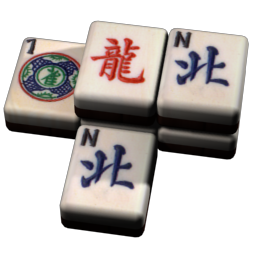 In Pretty Good MahJongg, you can play 10 different types of solitaire and puzzle games, including MahJongg FreeCell, Crazy Quilt, MahJongg Klondike, MahJongg Spider, and MahJongg Gaps, playing card solitaire games adapted to only 3 suits with 9 ranks, plus extra tiles (such as Dragons). In Pyramid of Wild Dragons, you build pyramids from a hand of tiles. In Great Wall, you match tiles to remove them from a grid and then the tiles above fall down to fill in the gaps. In Pelmanism (Memory), you play a classic game of memorization and recall. In Four Rivers (Shisen-Sho), you remove proximate pairs of tiles until the tableau is cleared, while in MahJongg Stones, you add single tiles to a zen garden until all of the tiles rest in harmony and balance. Of course, PGMJ also features standard tile matching, and it ships with 300 layouts, including “Standard” (the most common layout); you can play more than 2 billion deals of each layout, and these deals can be (by default) guaranteed winnable. However, registered users also get an integrated layout editor that allows them to create and play custom layouts, using up to 4 full MahJongg sets (576 tiles! ), alongside the other layouts. You can share these layouts with your friends or even share them with all other players. You can download more tile sets (for both solitaire and tile matching games), and with any image editor you can create your own custom tile sets. Pretty Good MahJongg just celebrated its 10th birthday in October! This was the first full game that I (solely) wrote to be published by Goodsol, and it remains the one game that I still play almost daily a decade after its initial (1.0) release. I also flexed some quasi-artistic muscles and generated three tile sets myself, including two (Simple Tiles and International Marine Signal Flags) which ship with the game, and the other, Playing Card Tiles, which is currently the most popular downloadable tile set. Active development continues, as version 2.5 with even more games and layouts is scheduled for 2013. Newsbrief: A new web forum is launched. This week, Goodsol Development launched its new/improved Goodsol Solitaire Forum, now available at http://www.goodsol.net/forum (same old address). My profile name is Seelhoff; I hope to see you there. Apple launches the Mac App Store with titles including two of our products. Last Thursday, Apple released Mac OS X 10.6.6, a free update to Snow Leopard, and the primary change is the addition of the (much anticipated) Mac App Store. The Mac App Store is an online store for direct purchase and installation of software, modeled after the App Store for iOS; it replaces Apple Downloads, which officially closed on the same day. At launch, Pretty Good Solitaire Mac Edition 2.14 and Pretty Good MahJongg Mac Edition 2.01 were both in the Mac App Store product lineup. Pretty Good Solitaire is currently #5 on the ‘Top Grossing’ list for card games, and Pretty Good MahJongg is #100 (with a bullet!) on the same list for puzzle games. Our other three Mac products (Most Popular Solitaire, Goodsol Solitaire 101, and FreeCell Plus) should be available there in the near future. If there is interest (i.e., comments left to this effect), I can document the various obscure and undocumented problems we faced during the initial submission process in another post. A favorite product is now available on a new platform. This week, Goodsol Development released Pretty Good MahJongg Mac Edition 1.0, our very first published Apple Mac OS X version of this award-winning title. Pretty Good MahJongg Mac Edition is a MahJongg solitaire game which has 160 different tile matching layouts, but also 32 original solitaire games played with MahJongg tiles, as well as a custom layout editor (only available in the full/purchased version). The develoment of Pretty Good MahJongg Mac Edition took longer than originally anticipated, due at least in part to working on three different products for three different platforms simultaneously. The end result, though is very satisfying, and this Mac Edition has all of the same gameplay features as the Windows version, including downloadable tile sets. The next major update of PGMJME will bring the number of solitaire games (and tile matching layouts) even with its 8-year-old sibling, but that is in the (not too distant) future. For the moment, I am looking for the expected 50% productivity gains on the other two major upcoming releases. You can download a trial version of PGMJME 1.0 from the Mac Edition web site, and you can purchase Pretty Good MahJongg Mac Edition for only $24.95. (Registered users of the Windows version can find a link for a discount coupon on the Goodsol web forum.) What a deal! I challenge anybody to catch me in Free Klondike (one of the original solitaire games in PGMJME, and my favorite) playing in climb mode.